stbs, originally uploaded by jahansell. 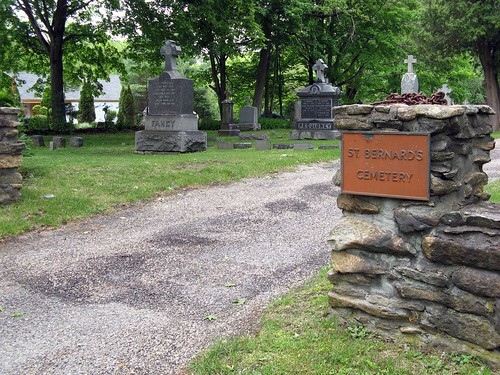 I thought I'd seen all the cemetaries in Sharon, but I had never been in this one, right in the middle of one of Sharon's prettiest residential streets, Sharon Valley Road. It's an interesting area - a mile long, and the only relatively flat, straight, densely populated street in Sharon - it feels most like a real "small town" as opposed to spread out rural village. The cemetery is filled with some of the most familiar names in the town, too - I recognized almost all of them. Hi Jenny thanks for visiting & commenting on my blog - I have been a fan of yours for about a year now - I've checked out mosto fo you links but I still just mostly visit your blog regularly - I'm from the Chicago area but your pictures are just the right mix of city and country for me I especially love the lone trees - Could I draw them some day and give you a print?? ?